Hello. I'm Erena Shkodra, Owner, Director of Education of Mathnasium of Lakeview-Mississauga South, your neighbourhood math-only learning centre. We help kids in grades K-12 understand math by teaching the way that makes sense to them. Mathnasium of Lakeview/Mississauga South offers tutoring only for mathematics, homework for kids, and test help to students in the Port Credit, Lakeview, and Lorne Park communities in Mississauga South. We are awarded TOP CANADIAN CENTRE in 2018! Our expert math staff is passionate about providing math help and encouraging kids in our community to improve and excel in math. Our long experience with students with ADHD, Dyslexia, as well as Autism enables us to reach every student! We offer both year-round and summer-only math programs, as well as March Break Camp and Summer Camp. My daughter is so much more confident with math now and she is doing well!! Math was the subject we used to be most concerned about and now it seems it is the one she can rely on doing well in! The staff are very supportive and she is very comfortable with attending and working with them. Thank you! We like Lakeview Mathnasium. We can see the improvement in our daughter. My daughter enjoys being at Mathnasium. Ms. Erena always keep us updated with our daughters progress. Thanks for all your support. Its been a pleasure working with the Mathnasium team. My daughter now enjoys math and looks forward to those sessions! My son really enjoys coming to Mathnasium. He comments all the time how it makes him better at math. He says that he wishes the teachers at school would be able to explain things the way the teachers in Mathnasium do. Great experience however we would like to see kids having some (home)work at home to practice on the subjects tough in class. This place is perfect. Period. Our kid STILL loves it here!!! It’s really improving her math skills and she enjoying math more and more each day. We don’t have to ask her if she’d like to go...she asks all the time! My daughter has been with the centre for more than 3 years and there has been a progressive and significant improvement in her understanding for this subject. Her grades have increased significantly. I really appreciate the individual attention that my daughter receives whenevrr such is required. Bssed on my experience and the progressive reports that I receive monthly, I would not hesitate to recommend Mathnasium for anyone who is seeking quality tutoring for their children. Best math centre in Mississauga! I like that my daughter has a personal learning plan and one on one reviews of problems. Thank you Maria for spending extra time with Julia! My child has been going to Mathnasium for the past 2 years. We see the confidence she developed in math. She has solid understanding of each math topics. Her school teacher always have positive comments for her number sense as well as her mental math. I think it is important for kids to have a solid math understanding so that they have the confidence in themselves that they can do math. Mathnasium also indirectly teach them that through hard work and practise, they can solve any hard questions. My child may not always look forward going to Mathnasium, but she always come out happy and proud of what she learnt and accomplished during that hour of math. I thank everyone in this Mathnasium for their patience and hard work that they put in for the kids. Our daughter just loves going to Mathnasium!! My child loves math, thanks to Mrs. S and the wonderful staff at Mathnasium! Her confidence and marks have greatly improved since coming here. Thank you! Mathnasium has been the exact kind of support we were looking for - positive, personalized programming that build her skills and addresses gaps through consistent practice and feedback. We are so pleased with the centre director and staff at Mathnasium Lakeview. As a teacher myself, I appreciate the regular feedback and evaluation conducted as part of the program, and the patience and skill shown by the instructors. The teachers are very friendly. I learned a lot. I didn't know multiplication before but now i do they have taught me a lot. They help with homework. They teach in a way that makes it more funner and effective. Can't say enough positive things about Erena and her team of instructors, they are truly committed to the students. Erena is one of a kind, cares deeply about her students and provides a very tailored approach to each of their learning. This program has strengthened our child’s math foundation in a fun environment that has built his confidence and made him want to come back each time! Thank you! Erena genuinely cares about the students and she always makes the time to discuss my child and any concerns that I may have. We love Mathnasium. Our son has learned so much there. The support from the team at Mathnasium has been unparalleled. We can't thank Erena, Maria and the rest of the team enough for all their dedication in helping our son. I absolutely love the Lakeshore Mathnasium , but am hoping that with attention now split between two sites the high standard we have come to expect will not be affected . Erena and her team have welcomed my daughter to Mathnasium and have made her feel comfortable and excited about improving her math skills. The program provides the right amount of incentives to keep my daughter motivated and eager to keep learning. She’s very excited about going to Mathnasium and she wishes she could go more often. We hope this continues. So far, we are very pleased with our decision to have our daughter join Mathnasium. I feel the children are doing better and have an understanding of the math that i am unable to tend to their every need. Mrs. S, Jon and all of the instructions are amazing!!!!!!! Mathnasium has given my daughter the skills, strategy and confidence. She loves Mathnasium —and now loves math! My daughters are motivated and excited about attending their sessions! Their attitude and perspective about math has changed thanks to Mathnasium’s approach! Very useful for High School Math students. Great tutors and e-mail progress feedback is excellent. Excellent! My son asks to go. Happy to see him enjoying learning math. Our daughter just started a month ago, she enjoys going there and learning new skills. So far it's great! We love it. Noah is always really excited to go there. Erena has decided to take on a Mathnasium in Clarkson and I couldn't be happier !! Much closer for me and still the great help for my kids with their math. We are very happy with Mathnasium Our daughter is doing so good in math. Her confidence is growing. Now she is convinced that she is good in math. Love it. We have had both of our children in Mathnasium of Lakeview since the beginning because of the brilliance and talent of Mrs. Shkodra. She sees the diamonds in rough and nurtures each and every child until their brilliance shines and they begin to beam on their own. She is a unique and special person and an especially gifted educator. We have raved about her to everyone we know and many of our children's friends and peers have ended up at her center as a result. She is one of kind. Our daughter looks forward to attending Mathnasium! She says it a FUN place to hang out for an hour. It makes math less intimidating for her and we are happy with the outcome thus far. Great foundational teaching and an enjoyable learning for the child. Erena and the team are fantastic! My boys loved their experience while they were attending Mathnasium. Would highly recommend - my boys understand math on a whole other level as opportunities were identified and brought back to basics. This has made a world of difference. They just started at Mentor and have brought home 96-100% in Math tests. WOW so impressed. My children have been attending Mathnasium for years (since before grade school). I tell anyone who tours Ms. S’ centres (she now has two locations) that joining is a good decision and Ms. S is amazing. I have confidence that my children will not struggle in math. The evidence is in the report cards! A big 'Thank You' to Erena, Gjon and all their staff. Our 3 children has been attending Mathnasium for the past 2 years. Their experience has been outstanding. Math has become our children's favourite subject. The dedication and knowledge of all the Staff at Mathnasium of Lakeview/Clarkson makes it fun yet educational. There's not a day where our children refuses to go for their lessons. They can't get enough of Math! We are very happy with our experience at Mathnasium. Erena and John provide great customer service and they are very attentive to the needs of the children. They provide a creative and comforting environment, which I believe gives the kids more confidence. Lomax loves coming to Mathnasium and has had so many positive experiences with all the teachers. It is really making a difference in his confidence in his classroom! The learning system is excellent, Mathnasium is very helpful and we have seen better results. Thank you Mathnasium. Would recommend 100%, we've been with Mathnasium Lakeview for 3 years and can't say enough about the program, instructors and of course the owner/manager, Ms Shkodra who provides every child With individualized care and attention. a great team that is always willing to above and beyond with my kids! Thank you! It has been a positive experience for my daughter. You have been supportive around her needs and helped build her confidence in doing math.Thanks for all your help. It is worth the drive from Caledon to Mississauga because Ms. S really cares about the students learning. We appreciate the close follow up and individual attention to our kids' needs. However, I would expect the challenge them with some problem solving quizzes every time they have a session even if you have plan to build solid foundation. Problem solving opens their eyes to new ways and tricks to solve and look at problems and at the same time keep them engaged with the instructor. I like the flexibility and the rotation of people Niah works with every time as that gives her exposure to more than one person’s style and allows her to become comfortable with meeting and working with new people. I've seen a definite improvement in my children's math grades and a change in their confidence when it comes to doing math. The staff are friendly and the environment is really supportive and encouraging. In only the first month, my daughter's skills and confidence are noticeably better! She is confident tackling her homework, wants to talk about math, and loves her Mathnasium sessions. The staff make a point of connecting personally when we pick her up and drop her off, and we love what we see in the interactions between teachers and students. Patient, encouraging and supportive - Mathnasium has been the perfect fit for our child! I've now send my 2nd daughter to Mathnesium. Very impressed with their technique of teaching, how students learn/understand, friendly staff and overall a comforting place to learn. Mrs. S and her team are phenomenal! My boys have improved immensely and their confidence has grown. Couldn’t ask for anything more! Only wish we would have found the centre sooner! Our experience has been fantastic with Mathnasium. Both of my children have benefitted greatly and enjoy going !!!! Thank you to all the staff that make it so fun for the kids while they learn ! My son and my daughter have greatly improved their math skills. What I like about the program is that there many instructors which gives the kids the 1:1 attention they need, as opposed a traditional class room. Plus the rewards/cards system motivates my kids to work harder. Mrs S and the team amazing. They are always helping/motivating the kids. Not once have I heard from my kids they don't want to go for class :). Keep up the good work. Very well organized. Very friendly staff. My son is not only learning but also enjoying the time there. ERENA will always find a way to make him work hard and give him confidence. Highly recommended. They have a very friendly environment for my children. Although my kids didn't want to go at first they never complain or fuss when it's time to go to mAthnasium. My children are happy while there. They feel good to know they are learning and becoming more comfortable with math. The staff is very well informed on what children are learning at school and what is missing from their day to day learning. I feel my children are doing much better and have grown in confidence when it comes to what they know in math. Thanks!!! I see improved confidence in my child for sure. Just waiting for it to be translated into good grades! I could rave about Erena and the kid's experience at Mathnasium endlessly. She cares about each and every one of her students and her diligence shows in the instructors she chooses and the nurturing environment she has created. We have been with Mathnasium for over 3 years and the kids capabilities have excelled under Erena's tutelage and they have been an example to all the kids in their school, many of whom now attend Mathnasium because of the progress they saw Erena develop in our children. Erena's Mathnasium is the best ! The teachers are very attentive, and thorough in reviewing the different math concepts that my daughter has struggled with. My daughter enjoys attending Mathnasium and we have seen a significant improvement in her math assessments at school. She is much more confident in attempting math problems. This was a worthwhile experience for my daughter. Whenever she encountered difficulty there was someone there to provide assistance and guidance to enable her to work at the problem and solve it for herself. She thrived at mathematics at high school because of the guidance she received at Mathnasium. It was most definitely money well spent. Prior to choosing this Mathnasium location, I did review other options and the owner, Erena is not just an owner but she is a person that actually cares about the students success and is passionate of what she does. She is not just a business owner but a human touch to the business. I have already recommended this location to other people. My kids also loved the whole set up from the onset of our interview to the day to day classes. As a parent, when the kids are happy, this speaks volume and is a testimony in itself. My girls (aged 9 and 11) are one month into the program and are loving it! Both of them are motivated when they go because they like earning stars as part of a successful reward system. In addition, Erena cares about her students and is very hands on to ensure they're understanding math in the simplest form and in a fun way. As a result, their confidence has significantly improved in a very short period of time! Kids very happy and enthusiastic for every session at mathnasium. They like their teachers and they love the way they interact with them. Mathnasium program is helping my kids become more and more goal oriented, more confident. Kids are very happy at Lakewiew that they don't want to change locations, even though the route is long and location is far. Thumbs up for management and teachers. We have had a great experience with the team of Mathnasium at Lakeview in Mississauga. The whole crew is absolutely fantastic. My son is always eager to go and ever since we have started with the team, we have noticed a difference in his marks, but most importantly we have seen an improvement in his confidence, which is absolutely amazing. Thank you so much Mathnasium!!!! We have 4 children enrolled in the program. 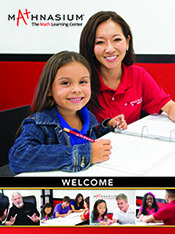 Each child has uniquely benefitted from the customized instruction. Outcomes include improved confidence in math and school test reports have also improved significantly! The skill, knowledge, care and compassion of Erena and her staff is amazing. They bring new hope and understanding to the math world. They are phenomenal. MY daughter used to hate math and had no confidence. In only 4 weeks with Erena and her team, she completely changed. She goes to Mathnasium with a smile on her face. Amazing! My daughter thrives at high school with confidence because of the excellent tutoring and guidance she has received at Mathnasium. I don't have to remind her to attend sessions, she goes willingly. This was money well spent that has ensured high grades and vast confidence in my daugther's capabilities. My children, who never enjoyed math before we signed up, now talk excitedly about math and look forward to going to Mathnasium. They now speak about math with interest and more importantly with confidence. The staff are all very friendly and kind, providing a space that allows my children to explore their skills and develop a strong growth mindset. We are extremely happy with our decision to sign them up! My son looks forward to attending Mathnasium every week as he has developed a great relationship with his instructors! I am very pleased with how both my 2 children enrolled in the program are doing. They thoroughly enjoy math and work hard and are provided positive constructive feedback as that is crucial to success. Erena (owner) is personable, friendly and truly knows how to run a successful math program geared towards the curriculum. Please reduce sugary treats if possible. Just a suggestion. However it really does work. My daughter has learned so much already! She's only been attending for a month and she loves it and looks forward to coming each week! I'm noticing that she has the confidence in math and is eager to learn and be a part of her Gr.7 class math now! I appreciate that my child can voice their confusion with various math concepts and receive strategies to succeed. My High School child loves attending Mathnasium. It has been a very worthwhile experience for her, with plenty of feedback and very helpful guidance from the staff. Children are very enthusiastic about attending and learning math. Positive environment with a lot of support. Very welcoming, very informatinve. Great follow up responsible staff and very committed and engaging. My son is happy to attend the learning sessions and is becoming more confident in Math with every visit. A noticeable improvement. We are grateful for the efforts of all staff at Mathnasium Lakeview-Mississauga. Love the school and the teachers. My kids NEVER complain going. I recently got an attendance call because my kids missed a few days during the week. I was very impressed that they did that. It just goes to show you they really care about their achievement. Gjon receiving TOP CANADIAN CENTRE award with Larry Martinek.